Washington, D.C.–(ENEWSPF)– During a July 1O’Reilly Factor discussion about whether “the liberal media” are helping President Obama “advance his energy agenda by spreading global warming propaganda,” guest host Juan Williams advanced falsehoods about global warming. 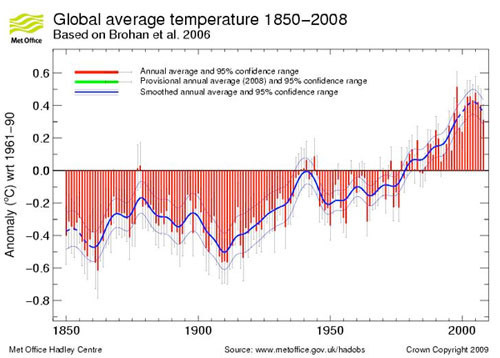 Williams did not challenge Fox News contributor Bernie Goldberg when he falsely claimed that if journalists “did some real reporting, they would find out that in the past 10 years, the world temperatures haven’t gone up.” But climate scientists reject the idea that the fact that, in most data sets, annual global average temperatures have not surpassed their 1998 level is any indication that global warming is slowing or does not exist. Scientists have identified a long-term warming trend spanning several decades that is independent from the normal climate variability — which includes relatively short-term changes in climate due to events like El Niño and La Niña — to which they attribute the recent relatively cooler temperatures. Williams also did not challenge Goldberg’s assertion that “this is déjà vu all over again. This is the 1970s, when journalists warned us of another climate, you know, catastrophe that was coming. That time it was global cooling. And they warned us of the coming ice age. They were wrong about that.” But it is false to suggest, as Goldberg does, that in the 1970s there was a widespread scientific belief that the Earth was cooling that is tantamount to the current scientific consensus on global warming. A review of the climate science literature from 1965 to 1979 shows this myth to be false. The myth’s basis lies in a selective misreading of the texts both by some members of the media at the time and by some observers today. In fact, emphasis on greenhouse warming dominated the scientific literature even then. But doesn’t the fact that there are a lot of Americans who are skeptical of global warming — not well respected scientists, perhaps, but ordinary people watching the segment — warrant at least some recognition of the other side? “There becomes a point in journalism where striving for balance becomes irresponsible,” says Pelley. WILLIAMS: In the “Impact” segment tonight: Is the liberal media helping Barack Obama advance his energy agenda by spreading global warming propaganda? Joining us now from North Carolina, my friend Bernie Goldberg, the author of the best-selling book A Slobbering Love Affair. Bernie, thanks so much for coming in. WILLIAMS: Now, Bernie, I don’t know if you saw this, but Scott Pelley of60 Minutes recently wrote that when he was doing a piece about global warming, he would not, in fact, interview anybody who had any doubts as to the veracity of the global warming charge. He said that would be like doing a piece about the Holocaust and talking to Holocaust deniers. Can you believe this? GOLDBERG: Yeah. Yeah, I can, because I read the interview and I saw the piece he did. It was a completely one-sided piece about global warming. And when he was questioned about it, he said precisely what you just reported — that if I interview somebody who believes in the Holocaust, do I have to find in the name of balance a Holocaust denier? This amounts to journalistic malpractice. That — it’s as simple as that. Journalists need to do a little reporting and not merely be cheerleaders for Al Gore and Barack Obama’s version of manmade global warming. And if they did some reporting, they would learn that the number of skeptics of manmade global warming is rising. It’s growing, the number of skeptics. And these include some very prestigious scientists. But you don’t see a lot of that on Page 1 of the newspaper. And if they did some real reporting, they would find out that in the past 10 years, the world temperatures haven’t gone up but may have even come down a little bit. But you don’t hear that on the evening news. Juan, we’re going — this is déjà vu all over again. This is the 1970s, when journalists warned us of another climate, you know, catastrophe that was coming. That time it was global cooling. And they warned us of the coming ice age. They were wrong about that. They never looked back. They never apologized. And if and when they’re wrong about this, they’ll just move on to the next crisis. WILLIAMS: Now, Bernie — Bernie, let me just protect you. You’re not saying they’re wrong. You’re just saying there are two sides to the story. Because the U.N. scientists, the G-8 scientists, they’ve all said that air temperatures are rising, ocean temperatures are rising. You see ice caps melting. You’re not saying you know. You’re just saying, let’s give everybody a fair say. GOLDBERG: Yeah, thank you for — thank you for clarifying that. I am, needless to say, I am not a scientist. I am willing to accept that there are two sides to this story, and both sides have legitimate scientists arguing their point. But you wouldn’t know that from the mainstream media. GOLDBERG: Not by and large, anyway. WILLIAMS: Bernie, let me ask you about the politics of this, because to me, the numbers are very interesting. If I am talking to Republicans — Republicans, Bernie — 60 — I think it’s something like 48 percent say yes to global warming. There is global warming. If I’m talking to independents, 67 percent say, “Yes, there is global warming.” But if I’m talking to Democrats, Bernie Goldberg, then I’m up to 87 percent say yes to global warming. Why do you get 48 percent of Republicans saying, “Yeah, it might be global warming,” but 87 percent of Democrats? Why the politics around this? GOLDBERG: That’s a very good question. I think it has something to do with the media again. Republicans are less likely to believe or accept hook, line, and sinker what the media tells them. And liberal Democrats are more likely to believe it because a lot of the media is made up of liberal Democrats. So, I think — I think the filter that we get this global warming that it comes through is the media. And a lot of us on the right, we don’t trust the media as much as liberal Democrats do. And again, Juan, the media gets a lot of these things wrong. They got global cooling wrong. Why should we necessarily believe that they got this story right? And what bothers me the most about this is that they have absolutely fallen into line with Al Gore’s version of global warming — that it’s manmade, case closed, I don’t want to hear about it. Scott Pelley’s example is the best one you can come up with.